Questions about what the professional responsibilities of advisers in a consumer protection regime are lie at the heart of the Financial Advisory Disciplinary Council (FADC)’s first non-disclosure case. Sitting at the Auckland District Court on Monday, the FADC conducted a hearing into the case of an Auckland-based insurance adviser who is alleged to have failed to disclose pre-existing medical conditions on two client applications. The case was bought by the Financial Markets Authority (FMA), but FADC chairman Bruce Robertson has suppressed the name of the adviser and the two clients until a decision on the matter is made. The FMA’s counsel alleges the adviser breached Code Standard 8 by failing to ensure fulsome disclosure of his clients’ medical history and that this meant he did not provide good, personalised service to them as required under the Code. 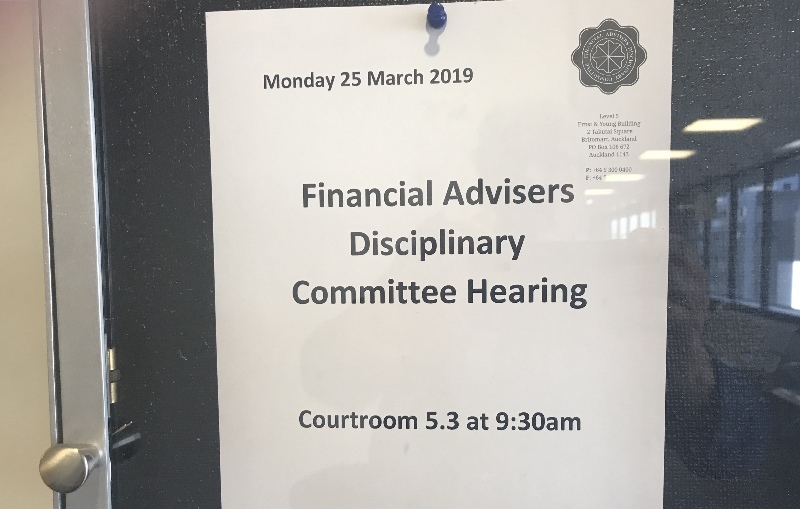 While the case was of a “lesser order of seriousness”, it was one that has important consumer protection issues and is significant in the financial advice context, he told the hearing. “Failure to ensure that fulsome disclosure is given is a common reason why insurance might be declined when claimed. So financial advisers must do their best to insure it occurs. The FMA alleges that is what happened in one client’s case as the failure to disclose his medical history had serious consequences, with his policy ending up being cancelled. This client, who was the first witness, originally bought a Sovereign policy through ASB then switched to a Partners Life policy on the advice of the adviser. He alleges that, over the course of several “rushed” meetings with the adviser, the adviser didn’t ask him about his medical history at all and that, for this reason, he didn’t disclose a number of medical issues. These issues included a back “ailment” which had been the subject of an exclusion in the Sovereign policy and which became the focus of much of the hearing. The witness told the hearing he didn’t read the application in detail as he “had faith in his adviser” and only realised there was might be an issue with non-disclosure a couple of years later, in 2015, when he raised it with the adviser. Under cross examination, the witness said that it was all about income protection and reducing his ACC cover so he didn’t see the need to discuss any pre-existing conditions himself. As such, he thought he had disclosed everything required. The counsel for the adviser disputed the witness’s version of events. He said the adviser had worked through the 30-plus page application form in detail with the witness in several “relaxed” meetings, despite the witness’s claim he had no memory of this. It was during this process that it emerged there was an exclusion in the witness’s Sovereign policy for a back “ailment” which the witness did not want to disclose in his Partners Life application, he said. His client took the witness at his word and, despite advising him of the significant risks that came with such non-disclosure, did not disclose the back ailment in the application. The adviser said that it later emerged that the witness had not disclosed a number of other ongoing medical issues to him, or Partners Life. These were an arm injury which had required surgeries throughout his life and minor cardiac issues going back 10 years. But it was the non-disclosure of the back ailment which became a focus of much of the hearing – as the FMA’s counsel argued that it constituted a breach of CS8. That’s because it was a failure to provide good personalised service, based on the information provided, to a client. The second witness to give evidence against the adviser presented a more straight-forward case. He said he started thinking about disclosure when he changed his policy from the Partners Life policy he got via the adviser to a new Asteron Life policy arranged by a new adviser. In his view, the contrast in approach was marked. The adviser’s counsel said the reason for the difference in scope with the second witness was due to other reasons, including the witness’s new adviser’s desire to find a reason for the witness to change policies and generate a new commission. Several expert witnesses also provided evidence for the FADC hearing. One said that, although the landscape has changed following the code revamp in 2016, it would still have been good practice prior to that for an adviser to refer back to his clients’ medical history when providing advice. Under the principles of the 2016 code advisers do have a wider remit and disclosure obligations have become far more important, he told the FADC in response to questions. The other expert said he would expect that an adviser would have strongly recommended that the first witness’s back ailment be disclosed, especially given the Sovereign exclusion. In a situation where the client refused to agree to disclosure of the issue, he would advise them to change their mind and advise them of the risks they are taking by not doing so, he said. “I would make a file note about the refusal and probably advise the insurer, which would prompt closer examination by the insurer. There is a responsibility to not allow a mis-statement to be made to an insurer. The FADC hearing finished on Monday and the Council has reserved its decision till the “earliest possible opportunity”. I'm the adviser in this case. Miriam has done a good job to encapsulate most of the details of the case. I would add a couple of points of clarification. The first client non-disclosed a number of health issues when he applied for cover with ASB - long before meeting me. Whilst the 'back ailment' received much of the attention in the courtroom I think the industry would be just as interested to know that the client applied and non-disclosed for the ASB cover just one week after commencing a cardiac investigation and 1 week before he was booked to undergo testing. I'm possibly too close to the case to see past this but I feel it paints any evidence given by that witness about my alleged failure to extract his disclosures. The second client works for the first client. The second client's later disclosures to Asteron were so minor that they didn't place any exclusions on his cover. However, he thought he did have exclusions because the later RFA told him that he did. The RFA also noted on the replacement form for Asteron that the second clients Partners Life policy could be voided for non-disclosure. All of his missed medical questions amounted to no more than misstatement. The FMA drafted the second clients sworn statement to include "I do not recall being asked about my medical history..." when it's own telephone transcript with the client initially clearly records that "He (the second client) remembers being asked some questions about previous medical conditions...". The second client confirmed that we discussed medical conditions on the stand. Both clients completed their application with Partners Life in their own handwriting. An interesting case - to me it would appear that the primary issue is the adviser being aware of a back issue and not making the insurer aware of this (or the existence of an exclusion on the Sovereign policy which would have raised flags at Partners). Some further questioning by adviser at time of application would surely have raised some inconsistencies with client answers and suggested Partners be alerted or adviser walk away from providing service? "The FMA’s counsel alleges the adviser breached Code Standard 8 by failing to ensure fulsome disclosure of his clients’ medical history," This seems to imply the adviser has the duty of disclosure of the clients medical conditions - patently absurd. The duty of disclosure is squarely and properly with the applicant for insurance. This has been confirmed as appropriate in judicial precedent many times. The applicant for insurance is the only person who has knowledge of their medical history "their medical history is uniquely within their knowledge" and accordingly they are the only ones able to discharge this duty. Warning of the duty of disclosure and its consequences is one thing but no adviser can "ensure fulsome" disclosure by an applicant. Sure Tash but there are plenty of instances where clients are guided by Advisers around disclosure and told that they don't need to mention 'minor' things etc, agree that Advisers can't ensure full disclosure from clients but they can certainly assist with this through their actions / reactions / behaviours.